Anyone who knows me, knows that I am mad about cheese. Actually, scratch that, I am absolutely head over heels in love with cheese. When I walk by the cheese aisle, I like to stop and stare and imagine all the possibilities I can do with cheese. Anyway, it’s a sick disorder I have, I should really attend a Cheese Lovers Anonymous meeting because I’m not normal. Anyway, today, while at Wally World with Rhoda Clarice, I walked by the cheese aisle. I had a good look and I was instantly drawn to this magnetic beautiful block of cheese that I just absolutely had to have. You know the way some girls are attracted to diamonds and then they can’t look away? I’m the same way, except cheese is my diamond. Anyway, I pick up the block of cheese and I notice that it’s light, “40% less fat than regular cheese”.. BS! Cheese is cheese. Cheese is fat. I put the cheese in the cart and I walk away. When I get to the cash to pay, Rhoda Clarice asks me ever so nicely if I’m going to buy the cheese. I took a moment to think about it. I looked at the cheese, then looked at my stomach. I looked back at the cheese and then immediately had to find a place to hide this cheese because I didn’t want any association with it anymore. 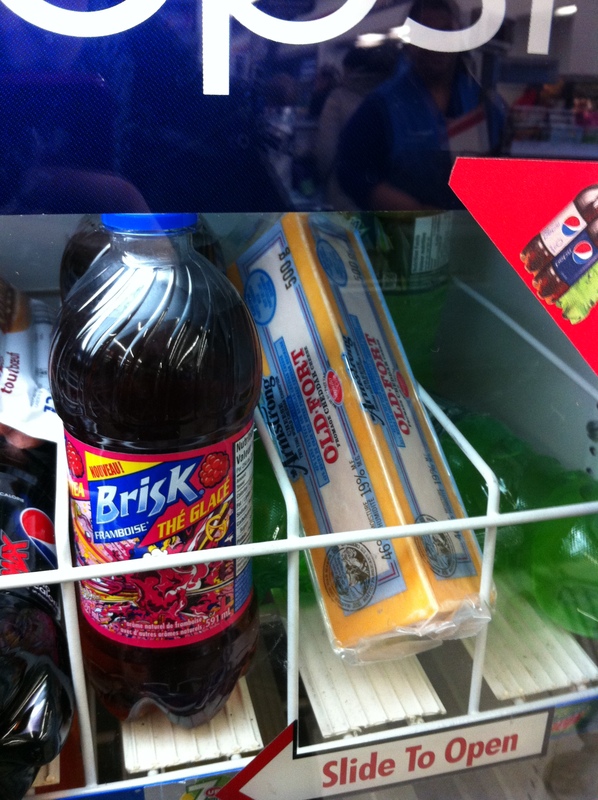 I felt bad just leaving it on the shelf to rot; cheese has feelings too you know, so I found a fridge. The fridge with the drinks at the cash. I have attached a picture so you can see what I’m talking about. Rhoda was so proud of me, but more importantly, I was proud of me. I said NO! Anyway Mr. Cheese, I hope you enjoyed your nice little cart ride around Wally World. Next time I’ll just wave at you instead of giving you hope that you’ll be coming into a new home. I have a severe case of Cheese Loving too. If you decide to open a support group I’m there with you! hahaha I don’t think I would have been strong enough to leave the cheese behind! Way to go!